University Galleries of Illinois State University is pleased to present Ebony G. Patterson: they were… from February 23 through April 1, 2018.
they were… presents mixed-media works and a three-channel video by Ebony G. Patterson, an artist based in Kingston, Jamaica and Lexington, Kentucky. Patterson uses vibrant colors, elaborate patterns, and opulent materials to grab the viewer’s attention and prompt a closer look and deeper engagement with the underlying issues of violence and visibility. Patterson states that her work has to do with “witnessing, access, and social politics,” not only in Jamaica but across cultures. 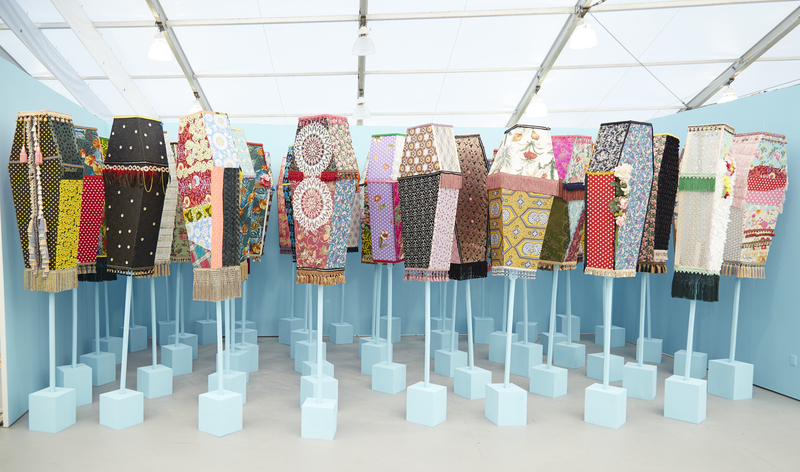 The centerpiece of the exhibition is Invisible Presence: Bling Memories, an installation of fifty coffin-shaped sculptures created for a performance during Jamaica’s Carnival celebration to address violence and socioeconomic divisions in the country. Citing the “exclusionary” and “commercially driven structure” of the event, for which costumes and permits are cost-prohibitive for most working- and middle-class members of the community, the artist says the works “seek to insert, assert, and interrupt the space of the visible with that of the invisible.” Made from an array of colorfully patterned fabrics, crocheted doilies, sparkling rhinestones, and fabric flowers, the sculptures comprising Invisible Presence: Bling Memories were inspired in part by “bling funerals,” extravagant ceremonies organized in Kingston’s working-class communities to ensure that the recently deceased, who may have been overlooked by society-at-large while living, are noticed and remembered in death. Patterson collaborated with art students in Jamaica both to make the works and enact the performance. After trying unsuccessfully to secure permission from a private entity (the organizer of Jamaica’s Carnival) to parade down on a public street, seventy students and collaborators marched with Patterson for more than an hour in a guerilla-style performance, complete with their own band. Patterson’s accompanying video, made in collaboration with Michelle Serioux, presents a nearly ten-minute version of the day’s events. We see a group of people working together to fabricate the “coffins” and load them into a truck. They then unload and distribute them along the processional route through the streets of Kingston. Among bystanders, law enforcement officers, marching bands, and costumed dancers, the participants in Patterson’s performance carry the sculptures as symbols of protest, hoisting them above their heads with fringe and tassels blowing in the breeze. At times, they turn them sideways and dance with them. All the while, the St. Michael’s Marching Band plays popular funerary hymns. Also included in the exhibition are Root & Shrub and Root & Shrubz, two large-scale floor-based tapestries that address visibility and violence. The photo-based fabric works are hand-embellished with lace, cotton, plastic, glass, and rhinestones. Beneath the alluring materials lie the images of prostrate bodies. Patterson was inspired to make these works after reading about the murder of a toddler in a housing complex. She said that passersby took photographs of the child’s body and posted them on social media sites in an effort to raise awareness about brutal conditions. The artist, however, fears that such repetition of online sharing removes us from an individual’s humanity, instead rendering the deceased as simply an image to be scrolled past. The paradox lies in the fact that many of these individuals would be relatively overlooked or forgotten if not for web-based sharing. Patterson writes, “The seeing is what happens in social media, but the looking is what I’m asking you to do. The looking requires thought, it requires engagement, it requires awareness, it requires presence.” Through her elaborate, multilayered works, Patterson urges us to bear witness. Ebony G. Patterson’s work has been exhibited at National Gallery of Jamaica, Kingston, Jamaica; The Studio Museum in Harlem, New York; Museum of Arts and Design, New York; DuSable Museum of African American History, Chicago; Museum of Latin American Art, Long Beach, California; Goodman Gallery, Johannesburg, South Africa; and The Power Plant Contemporary Art Gallery, Toronto, Canada; among many others. In 2018, she was awarded a prestigious $50,000 grant from United States Artists. She has also received grants and awards from the Joan Mitchell Foundation, University of Kentucky, and the National Gallery of Jamaica. In 2017, Patterson served on the Artistic Director’s Council for Prospect.4 in New Orleans. Her work is included in the collections of the National Gallery of Jamaica, Kingston, Jamaica; Studio Museum in Harlem, New York; Seattle Art Museum; Nasher Museum at Duke University, Durham, North Carolina; and Pont-Aven School of Contemporary Art, Pont-Aven, France. In fall 2018, she will have solo exhibitions at Monique Meloche Gallery, Chicago; and Pérez Art Museum, Miami. Patterson is Associate Professor of Painting at University of Kentucky. She is represented by Monique Meloche Gallery, Chicago. Ebony G. Patterson: they were… is organized by University Galleries’ Senior Curator Kendra Paitz and is sponsored by the Harold K. Sage Foundation and the Illinois State University Foundation Fund. Programs at University Galleries are sponsored in part by the Illinois Arts Council Agency. The opening reception is sponsored by Hyatt Place, Bloomington/Normal. All events are free and open to the public. Contact gallery@ilstu.edu or 309.438.5487 to schedule exhibition tours. University Galleries is located at Uptown Station at the corner of Beaufort and Broadway streets. Parking is available directly above in the Uptown Station parking deck, and the first hour is free, as well as any time after 5:01pm. If you need special accommodations to participate in any event, please contact University Galleries at 309.438.5487 or gallery@IllinoisState.edu. All events at University Galleries are free and open to the public. For more information, visit galleries.IllinoisState.edu or call 309.438.5487. Find us on Facebook, Instagram, and Twitter. Sign up to receive emails by clicking the Newsletter link on our website.